On Tuesday night, June 24, a small room inside the Women’s Building of the Mission District filled with people who gathered to rally for the victims of a homophobic hate crime. They came to show support of one victim in particular: Terrain Dandridge. Dandridge, now 21, was one of the original New Jersey 7, a group of young Black lesbian women – Patreese Johnson, Renata Hill, Venice Brown, Chenese Loyal, Lania Daniels, Khamysha Coates and Terrain Dandridge – who were sexually propositioned by a 29-year-old Black man named Dwayne Buckle in what is known to be a prominent LGBQT (Lesbian, Gay, Bi-sexual, Queer, Transgender) community in New York called the West Village. It was the surprise of the event to find that Dandridge specially flew in from New York to be in San Francisco the very night after reclaiming her freedom. They tried walking away, but he followed them, at which time Johnson’s girlfriend made an offhand insult about his shoes. Surveillance cameras then showed Buckle wrestled one of the women to the ground. The video also showed chunks of hair in his fist. Surveillance tapes clearly show three men joining the struggle. The video showed one of the civilian men stabbed Buckle. Buckle admitted on at least two occasions while hospitalized with liver and spleen lacerations that it was a man who stabbed him, but gradually he changed his story to the press. Buckle was painted as the victim in several prominent newspapers with headlines such as “Man is stabbed after admiring stranger” and “Killer Lesbians mauled by killer court, media wolfpack.” Many papers described the young women as “howling” and Bill O’Reilly blatantly referred to them as “roving,” an animalistic description that denies personhood and the right to the presumption of innocence until proven guilty. The seven young women were charged with attempted murder, gang assault and assault in the 3rd degree that still appear as felonies on all their records. According to Dandridge’s mother, Kimma Walker, while awaiting their arraignment, the NJ7 were taken to Rikers Island only for holding, although it has no women’s facilities. Walker recounted her daughter telling her that she and her friends were informed they would be let go upon providing a statement. “Get me a good lawyer so I can stay out,” Dandridge told her mother. Dandridge reported learning not to give a statement from the TV series Law and Order. Three women – Chenese Loyal, Lania Daniels and Khamysha Coates – were given five years probation on pleas of not guilty. Thus, the seven dwindled down to the NJ4, as the group is more commonly known. Dandridge was to serve three and a half years, the shortest sentence of the NJ4, because the judge felt she took responsibility in a way the other three did not. Two years later, as of Monday, June 22, the group has decreased further to the NJ3 as another of the seven, Renata Hill, also had her conviction reversed on appeal along with Dandridge, although Hill is not scheduled for release as of yet. Hill is still incarcerated awaiting a new trial. 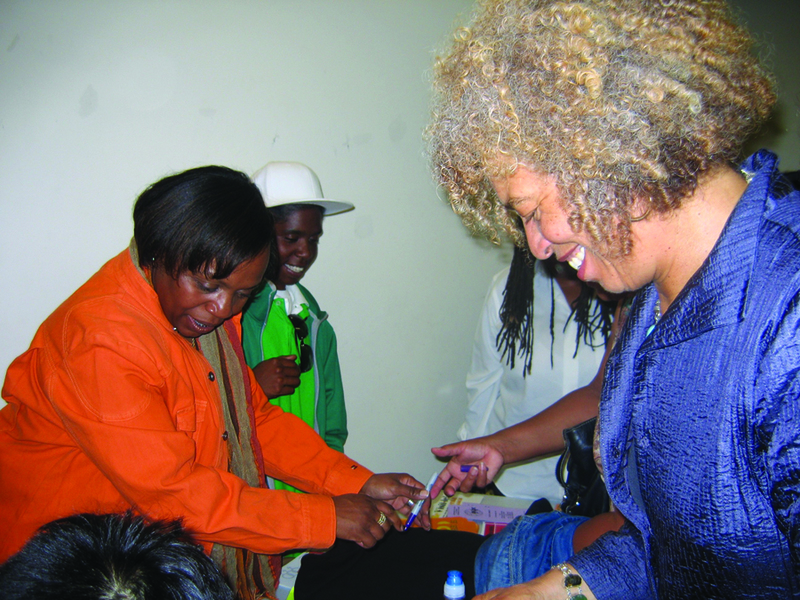 Aside from self-protection, professor and activist Angela Davis asked, “What’s to be done about the Dwayne Buckles?” It was made clear by presenters that the prison system does not stop the mindsets that perpetuate sexual harassment, nor does it free wrongfully incarcerated people. Some yelled out “re-education,” and “community involvement,” in a far cry from an angry gang of wolves. Maybe the best answer was given by Dandridge herself through a tearful poem in which she forgives the transgressors who abused her in the courts and in the actual victimization: “But I’ve got one better, I’ma still pray for you.” She expressed several times that her main concern was getting out her other three friends – Hill, Johnson and Brown – whose appeals will be heard in the fall. Additionally, Dr. Davis highlighted that the heart of the incident was not only an act of homophobia and sexism, but also racism. “This is 2008, and when we think about racism we cannot imagine it as being un-gendered; we cannot imagine it as being unsexed,” she said. Davis suggested that these women might have been treated differently if they were white and attacked by a Black male. “And I say this because there is no institutional mode of resisting homophobic attacks; there is no place to turn.” Still, inspiring people to move to protest injustice in the way the Jena 6 inspired people is harder when the acts of racism are institutional and not individual. Davis suggested making a website that will inform the public about the NJ4 and educate people about the myriad of ways in which racism moves. Other ideas for support, such as writing to the governor, can be found at www.amyewinter.net/nj4/. A sample letter is provided there. To learn more and get involved, email freenj4@ yahoo.com or visit http://freenj4.wordpress.com/. Quandra Chaffers can be reached at quandra.chaffers@ yahoo.com. Rules are always supposed to be equal for every person rather they are black or white. I have always been there to stand with the person on right because this is what justices say. Refuse to work, boycott canteen!